Last time we stuffed some par-baked panini rolls with egg salad and mixed sprouts we thought it was pretty good, so we did it again. 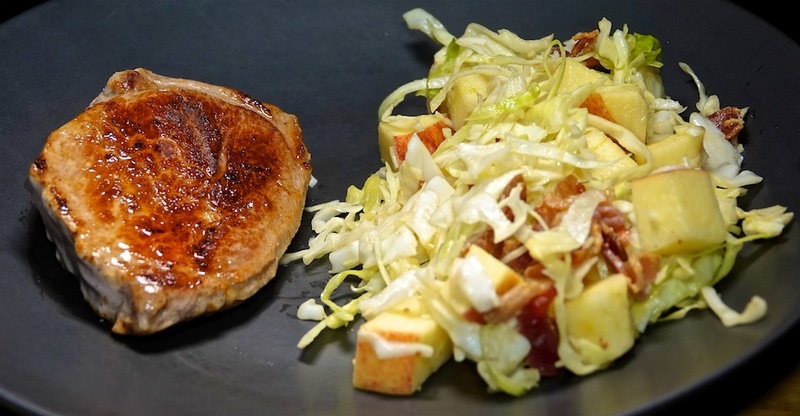 The Foodies had guests for dinner so we chose some boneless pork chops and pan fried them in butter, serving with a little Apple-Bacon Slaw. We got six serves from the salad. Dinner tonight was a great meal for $6.81 per serve. The pork chop was perfectly medium rare, and the salad had a great balance of acid, sweetness, salt and fat!